14km urban run with 9 obstacles. When the run is being done in the city, expect to run under and above the bridge, Uphill and downhill climb, Sharp turn around the corner, staircase run and lots more. So I would say it is not 9 obstacles but more than that. This time, around 20 Bruneians or maybe more than that participated in the race and mostly are from GetFit CrossFit. Our unofficial time. I was actually targeting to do below 1:30 hours but I was pretty much satisfied. All those training really paid off. I didn’t suffer as much as other races I have done. I feel good after the race. 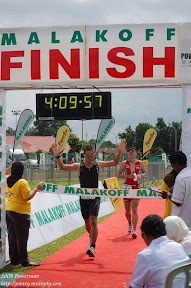 The only race that I can remember that my training really paid off was the KL towerthon which I did 5 / 6 years ago. First time starting in the front. Actually the race was flagged off in waves of 1 minutes intervals with 100 participants each waves. We were in the 6th waves. It was a good decision to start early because if you start late, the obstacles course will be fully jammed with people queuing up to take turn. The 1st Obstacles – Climb the container. The 2nd Obstacles - The Corporate ladder. over 800 steps not including the pedestrian bridges that we have to climb. The stairs was fully packed with runner walking. If you’re in the early group, it it is much easier to run up and down the stairs. The 3rd obstacles – Quantum leap. The 9th obstacles – the last one before the 500m sprint finish. ICY COLD MUD. It was a very good experience and definitely next year, I will join again and targeting to do better than this.